Who knows whether this will wind up meaning anything. Gruden recently called entrenched franchise quarterback Derek Carr “a hell of a player” and “a great quarterback” when reflecting upon the 47 sacks he’s taken so far this season, so it sounds like this would be, at best, an apprenticeship. 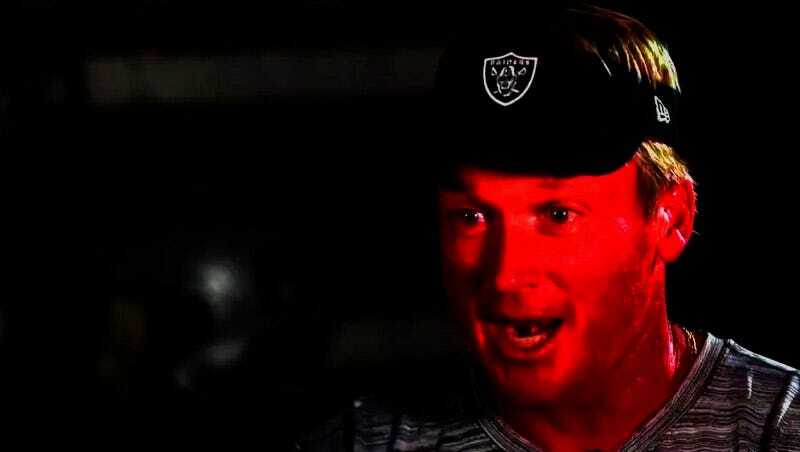 But if Gruden is, in fact, “very high” on Peterman—it’s unclear, for example, why a Bills writer would be all that up on Gruden’s feelings about anything—first of all what the hell, man, but second of all, it seems there would be very little by way of front office oversight to prevent this unholy union from taking place. Gruden has been heavily involved in personnel decisions with the Raiders, and most of that was before the team fired general manager Reggie McKenzie earlier this month. The prospect of Peterman under center in a Raiders uniform in a real, live NFL game is extraordinarily tantalizing, and Gruden appears to have the authority to make it happen. Now we just have to hope Peterman is among the group of NFL players who are “dying to come play” wherever it is that the Raiders will be playing next season. At Least Nathan Peterman Led The Bills In Rushing?